OK I'll have another guess, is it the red piste called Plan, off Solaise? Therefore south-facing? I'm trying to think of somewhere which has those warning triangles at the edge. @Steve Angus, photo is tete de solaise, top of Plan on far skier’s right, straight North aspect. @Grinning, hopefully that means I won!! @HoneyBunny/@Grinning, I was wondering about the top of Plan too, but the text made me think he'd been up the Bellevarde side (references to Olympique and green pistes, but that could mean laps of Madeline). I think you're probably right, but are there some of those markers on Genepy too? @Steve Angus I trust you didn't take success on their first blue as your cue to take the group down Plan! My first thought was that the 'Hors Piste' triangles could be along the edge of the Toviere plateau, making the photo from Cretes or more likely Rocs. But I agree that it is Plan, just below the Refuge de Solaise hotel, looking South East towards Les Danaides. HoneyBunny / Grinning - I think we'll call it a draw.... YES it is skiers right at top of Plan piste... BUT its not south facing - its 'straight North aspect' as Grinning says. Ha ha thelem very good... but I like the way you scrutinised what I wrote - led you a little off scent didnt I! Its amazing when push comes to shove how everyone comes together to work the answer out! Ha ha! bar shaker - 'looking South East towards Les Danaides' - yes totally. Well it was certainly a little colder today (partly due to the clock time changes Im guessing). Anyway as usual being Monday morning there was no sign of the kids getting out of bed early (typical really) but anyway we got sorted on time and off we went! I took Ben to creche before heading to the meeting point. I have the same kids from the same two families that I have this same week every year - 4 kids in total. Anyway we took it easy for the first day - working on some technique up the Solaise side of things - I was really impressed with how the kids skied actually! Lots of good skiing around and an amazing hot choc at the Datcha restaurant too... always amazing when the kids bring UK choccy treats like Cadburys mini eggs - my fav's yum yum! It was a good first day kids - another 4 sessions to go! I took lunch at home as I was meeting in La Daille for the pm session.... anyway the afternoon I had a Brazilian guy in his early 30's... OK his English was hit and miss but we had some fun... taking the time to get the bus into town and back out again would have taken ages so we just hung at the nursery slopes in La Daille. Anyway the snow being soft meant it was tricky and the nursery slope in La Daille is not the easiest terrain that is for sure.... anyway we had a fun afternoon... it was fun! Clare collected the kids in the afternoon and it was the usual evening activity getting the kids to bed! In local news the Scara race starts tomorrow... this is a 4 day junior (U14 and U16) race on the OK Orange piste at the top... first couple of days are the French qualifiers and then Thursday and Friday are when the international competitors come on board! So whilst there is some decent racing to be seen from some of the up and coming best junior racers in the world around the queues for the Marmottes lift in particular is pretty awful and haphazard (read that as badly organised / rude racers everywhere / pushing in etc - arghhhh!). Anyway the weather is going to change tonight and during tomorrow before really returning to mid Winter conditions by Wednesday - hmmm could be interesting! So anyway I met my team of kids and we aimed to work on carving today so the kids were on fire and we did some really fun drills and excercises. I did have to make a slight change of plan as one of the lifts I wanted to take was broken and out of action totally! Doh! We did a run or two on the skier cross and it was a great morning. The only issue was a hot choc incident where one of the kids managed to drop his whole drink over his brother that caused some disturbances - whoops! Im aiming to get the kids down some tougher black runs tomorrow - looking forward to that. Hopefully that is if the weather behaves which it might not! The figures suggest that it is even quieter over on the Tignes side and the only thing happening over there really is the British Ski Champs so not sure where everyone is over there - Val is a little busier but not too much. Oh and the Scara racing started today.... (Im intentionally not saying whether this is first hand account or not as it might give away where I was) BUT the scara racers have their own dedicated lane to get on the Marmottes lift AND since it doesn't seem to be too busy this week the lift queue there (unlike this time last year) does not seem to be suffering too badly - phew!). After lunch I had a private lesson with a guy who wanted to control his speed a bit better in short radius turns and feel a little more in control but he was really quite solid so we found some lovely snow on a red run and lapped around before finding a black later on - twas a really successful afternoon I thought - well done! Could be quite a lot of snow coming in over the next few days - yippee! This made me chuckle today too! 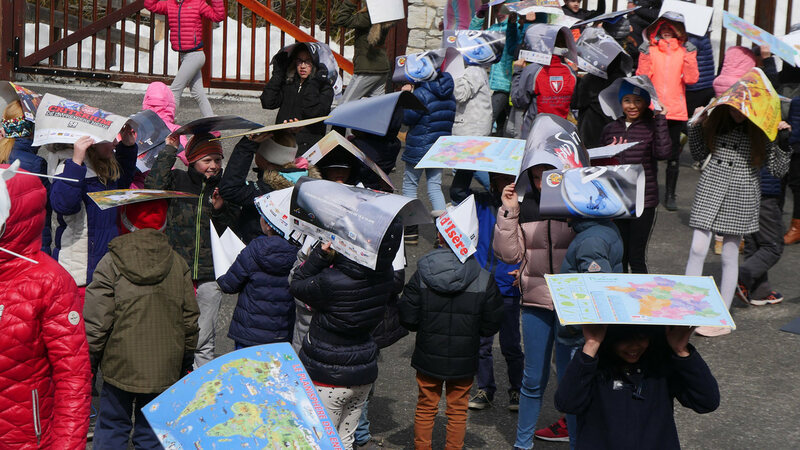 Finally an April fools story from here in Val yesterday - the local school kids were told to go outside in the playground and take shelter by putting a piece of paper over their head... they were outside to watch the migrating birds come overhead and in case of 'accidents' from the birds the paper might be needed to take the hit from the bird poo.... ha ha a snap of all the kids outside with the paper over their heads! Suckers! @Grinning, isn’t now so certain looking at the tufts of brush and lack of traverse lines to Borsat nord... dang. I agree with @Grinning, top of Borsat chair. @Steve Angus, this is the big sink hole off to the right of the Tommeuses chair, before the first ridge. Isn't this where Step Up is held, but which has been cancelled due to the snow forecast? @Steve Angus, possibly Loyes sneakily looking under Olympique before you go over the top ridge? I don't normally join in as I probably have an unfair advantage, but this one had me thinking hard and I'm still not sure. The chair is at least a 6 man, maybe 8, it is right hand up hill and looks like a Doppelmayer, almost sure its a detachable. The sun is high so between 10 and 3 at a guess so the chair is heading between south west and northwest and there's a lot of compacted off piste tracks, so on balance I'm with Bar Shaker and Grinning's second go - 2Mooses! BLIMEY !!!!!!!!!!!!!!!!!!!!!!!!!!!!!!!!!!!!!!!!! chocksaway that is some detective work! I think ill take a photo of 1 snowflake next time and see if you can still guess!!!! But yes bar shaker wins.... the Step Up is on the other side of the Creux piste though normally! Anyway back to the photo I intentionally made the view of the shadow of the chairlift cut off otherwise you would have found it too easy! Maybe to throw chocksaway off the scent ill 'flip' the photo around next time or something.... who knows! I met the team first up and given the weather forecast for the next few days I decided to make the most of it, get over to Tignes as well as take the kids down the Face for the first time. So yes we were off... after a few warm up laps on the Fontaine Froid which was in amazing condition we headed over towards Tignes and it was noticeable that there was a very stiff Foehn wind blowing and with clouds about it was a little chilly much more like Winter that is for sure! Anyway the run down Trolles was a good one and again Trolles was in very good condition - I was most impressed with how nice it was! Unlike last year when it pushed the kids a little too much which ultimately made me decide that it was a step too far this year they coped perfectly so we circled back around and took on the Face after a good hot choc stop at the Toviere restaurant atop of the same named mountain! The kids are so kind as they always bring me one of their bars of choc to have with them AND a cadburys mini egg too - yum yum thanks! Anyway we headed over the way (the queues were not too bad for the Marmottes lift despite the major numbers of young racers for the Scara comp.) and took the kids for their first run down the Face... they did really well and in all fairness the Face at about 1130am (even if I do say so myself) was in perfect condition! Well done kids! They were (rightly) pretty chuffed with themselves! I had a long lunch break as timings meant that I head to get to the Folie to meet my 'usuals' for the pms during this week of the season! Anyway young H (not so little anymore) has once again grown so I needed to beast him about to tire him out - ha ha! Anyway the weather was moving in more and more so I decided to try something different and we ended up going to Brev and it was surprisingly good all the way down... we worked our way backwards from there towards Val Claret and little by little it was getting colder and colder and windier and windier and the vis getting worse and worse!!!! Anyway we made it back and ended up heading down the Face to finish! I got home pretty late in the end after stopping in town to pick something up and then it was a rush to get everything done in time! We also had Clares aunty and husband who have just arrived in town pop around for a drink quickly too! Anyway not much else to report from today! So ill sign off for now. Now thats a proper break! I had it down as a 6 or 8 seat detachable, but thought Borsat was a 6 seat. I considered Tommeuses but the mountain in the background looked too close. The kids were up early again and that is never a good way to start the day!! However when I looked out the window and I could see that we had a few cms of fresh which meant more up top - it was a return to Winter for real! The thermometer was not showing a massive drop in temps (although it was forecast) so I was optimistic! So after dropping Ben at creche it was off with the team... the weather was way better up high than it looked and was forecast which was good news... there was banks of some pretty heavy cloud / fog about but virtually no wind at all and with about 15-20cm about it was lovely conditions! Not many people fancied it up there as it was quiet and of course the Scara race up on the OK Orange could not take place today so that meant things were even quieter! It was the first time the kids had been skiing in conditions like this therefore whilst the terrain did not challenge them today it was the weather and the snow that did. Anyway they enjoyed playing about in the powder and they made some good progress. However we tried to stop at the Bellevarde for hot choc break but it was totally full up therefore me had to head downwards to the Matmottes instead... all these things eat into ski time... oh well! Lunch was taken indoors to get away from the weather as it was a little colder than it has been! The afternoon with H we bombed about making the most of some lovely snow and found some great conditions all over the place and had the Arcelle pretty much to ourselves... it was a really fun afternoon! After dropping him back at the hotel I headed home and checked in with Clare who had been to Olivias teacher / parent meeting and she was given the thumbs up for progress - good girl! Tomorrow the sun should be shining so it should be a lovely day on the hill! Not much else to report from today! I second Backcountryboarder. My initial thought was that this was taken from Arcelle looking across to Santons. Therefore Manchet and Loyes would be the obvious. ^ agree with the others, I think you can see a tiny bit of the cable of the Manchet lift. Morning all. I’m in Val for a few days with my 12 year old daughter. Wondering if anyone can recommend a good value instructor for a half day lesson. We’re both able to bomb round anything on piste and would love a guide / instructor who couldn guide us round with a few tips along the way! Manchet, loyes and a pylon of the Olympic ? There's a ski lift in that picture? Backcountryboarder and sno trax - it is taken from Arcelle indeed looking across. thelem - indeed there is.... the actual answer (perhaps you had to be there or REALLY look closely at the pic!) is there are 5 lifts... Bellevarde Express top of, Loyes Express (most of), Olympic lift - pylon, there is also part of the Manchet Express cable on the rh side of the pic too AND FINALLY (no one said it) the Fontaine Froid lift! Rhg76 - we have availability for an afternoon session this weekend and next week but not mornings I'm afraid - if that works for you then drop me a line! Today has been a busy day... I found it difficult getting out of bed this morning - fatigued doesn't cover it at the moment! Anyway I met my team and we worked on some carving on the way over to Tignes and did a fair few laps of the ski cross course over there - the kids loved it. With the British Champs in Tignes at the moment and the Scara in Val the place is awash with racers it really is! With the sun shining we were off to make the most of the best conditions but we needed a break so had a nice drink at The Corner in Val Claret! We did finally make it back to Val for midday just as the temps were really heating up! I had a long lunch break in the sun waiting for my afternoon lesson to start and it was nice just to chill out for once actually! It was pretty fast turnaround when I got home as we were heading off for dinner with Clares cousins and family - as usual The Barillion down here in La Daille was awesome! P.S. another full day teaching tomorrow! Some lovely wintery powder out there as the temps plummeted over night coupled with the fresh snow that has fallen! Just when you want the kids to actually sleep in - oh no non of that! So Clare was at home with the kids and having some friends and their kids around this morning so the morning was a relaxed start to keep energy levels up for the rest of the day at home which meant my start to the day was chilled too after the initial early start - hooray! Anyway it was my last morning with team 'Angry Birds' and we were off to have a final fun day of requests... we did all the things the kids wanted from skiing the Face to the skier cross course, jumps and everything in-between and we even fitted in some technique on moguls! It was a nice morning. But hey the Foehn wind was not half blowing hard (all day actually) and the thick clouds that were developing towards the Fornet end of town were worth leaving well alone (there was a decent accumulation of snow up there again today!). So basically I stayed either Bellevarde or towards Tignes side of things all day. It was a nice morning (see you next year team) and then after a lunch break at the Sun Bar it was off to ski with a couple of 9 year old girls (new clients actually) and I headed to Tignes and had a really fun afternoon. Being very competitive I introduced them to the delights of the skier cross over there and they loved it - lots of work to encourage some better carving and it meant their times got faster and faster! A fun afternoon! I got back home and pretty much straight away Clares brother in law and family all arrived... so 4 kids and it was carnage for an hour or so!!!! Anyway nice to see them. The problem when friends and family come in peak season is that you struggle to see them! Ha ha! Meanwhile in a show of solidarity the local town councils all sent representatives to see off the last Eurostar of the season from Bourg Station this morning back to London - there were some very inventive Brexit related signage on show!!!! Anway folks we are expecting some more snow overnight and then tomorrow could be a pretty grotty day with the strong Foehn winds set to continue! Hmm could be another interesting day on the hill! As I always say in this job one of the most rewarding things is seeing people back year after year and when people develop and progress (and in the case of kids get the love of the sport as they grow up). Anyhow the kids both slept until 7 this morning (joy) and as Clare planned to take the kids swimming whilst I headed out to work it was a mellow start to the day! Yay! The weather was interesting as there had been a strong Retour from yesterday and throughout the night that had dragged in some thick cloud... the reports had it down that there was about 50cm or so in places up the Fornet! However the further from the Italian border you went the less and less there was - about 5cm down here in town! Anyway it was not supposed to get much worse or better as the day went on but certainly it was not that enticing out there! So I met the new team for this week and instantly remember some of the laughs we had had last year with the kids. This year the kids (brother and sister) had their school friend with them and we were ready for the off. With a rendezvous with the other kids and the various adults (there are quite a few kids and families all out here at the same time) at Datcha for a 1030 hot choc stop we were off... so a few runs around the top of the Solaise etc it was quite a fun morning! Good to see the kids back! I had an extended lunch break as I had a later afternoon start so treated myself to lunch at the Gourmandine! Yummy food in there I find in general! Anyway the afternoon was spent with another couple of kids I personally have not taught before but colleagues have! The weather had cleared up a little and it was looking promising but then closed back in again! So we did a little of everything but the kids especially loved the jumps in the snowpack! It was a really fun afternoon - finishing by skiing down through the trees into La Daille it was a cool way to finish the afternoon off! I literally dropped my gear at home and went straight back into town to settle our new guests into our apartment and collect the dirty linen! It was a dash... and when I got home all of Clares cousins and family etc were around for a cuppa... so there was about 20 people in our flat for tea and cake - it was manic... anyway nice to see them all and the kids had a energised time! So it was quite a clear up job that was needed and getting the kids into bed and bathed etc - knackering! So we are here now half way through the crazy period of school holidays and it is back to Monday morning tomorrow so I had better get off to bed! Hi @Steve Angus, using your best abilities, on a scale of one to ten, where one is the second week of January and ten is the main February half term week, how crowded do you think it will feel next week? And go to page 6 - an analysis of bed spaces taken / booked . Accurate up to 01 April. We just got back from a week (S14 30/03-05/04) and it says 54 % full. We never queued for a lift, even the Solaise and Olympique at 9 AM were quiet - although pistes coming and going to Tignes did occasionally seem busy. This week says 65 % - so a little fuller. But the week you are going ? 13/04-19/04 (i.e first week of main easter hols?) = 37 % ... of course last minute bookings if snow is good (which it is right now) may ramp that right up. Next week is likely to be similar to this week and nothing like Feb half term. Out of ten, on your scale, I would say 6. I'm heading to Tignes on Sat 13th for a week and have never been before. From looking at the map, it looks huge compared to Alpbach where we usually go (and which i could literally ski with my eyes closed I've been there that many times). My question is, as I assume I will not get to cover everything in a week in Tignes, what runs would you say are the ones that shouldn't be missed? You’d easily cover Tignes in a week I’d have thought? You can definitely cover Tignes in a week if you're trying to. You can do all four corners of the map in one day if you pick the right runs and lifts. What makes a good run for you? Long? Steep? Good snow? Twisty? Parks? * Aguille Percee (geographical point of interest just above the top of Sache, also has blue and red options down). These are all runs that are really useful to get between two places on the map, but because of that they are full of people who are skiing beyond their ability. lynnecha - hmmm interesting question... well as sheffskibod says that link has all the number crunching you can wave a stick up really. However I dont think there will be many last minute bookings really. Either way I would say on the scale of 1 - 10 it will be about 4 or so so pretty quiet! Doubt there will be any queues or anything to be honest! You thinking of coming out? BRi87 - I think the others have covered the answers quite nicely to your question! It was looking pretty grey and rather like yesterday afternoon at the start of the day.... however I didnt really have much time to look out the window getting the kids ready for school and then myself taking Ben to creche this morning - arghhh! Anyway I got Ben off to creche then headed to the meeting point. The team arrived and the plan was for a large group meet up at Grizzly's in Val Claret so thats where we headed towards taking in the usual fun runs, crocodile alley and all the usuals! Anyway little by little the blue skies arrived and things looked more and more like Spring again! It was a nice stop before we headed back towards Val to finish the lesson up! I was even able to take lunch in the (hot) sun back in Val before heading off to meet up with the girls from the other day... I skied them very hard, fast and a long way over the course of the afternoon and some of the best snow was as suspected up on the Val glacier - it was really really good actually. The girls were really tired when I finally returned them to mum and dad at the end of the day... bless em! No rest for the wicked as I then rushed off to the conference centre as there was a school show on - all the classes in Olivias school singing and dancing so it was nice to see her taking part!!!! So I finally made it home very late and and did the usual kids bath and bed time etc! OMG only another really long week to go and then finally some respite next week - can't wait and then we are on the home straight with the EoSB teaching coming up of course and then finally tax return and family birthdays season! Today quiz - something a little different - today the question is 'What is the NAME of this lift'... NO cheating and looking at the piste map please!